Goal: Over the years electric power in rural settlement has being shut off every week for 20-40 minutes. A client was not happy about this picture. Electric power was always necessary. Solution: A system of emergency stand-by power - uninterruptible power supply unit. 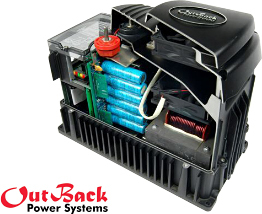 Realization: Уthere was installed an uninterruptible power supply unit from «OutBack» considering electric power consumption by the object up to 8 hours. Conclusion: Gel batteries are excellent as backup variant during black-out. Batteries, produced in America, are charged from external source and, when electricity in a village is shut off, they restart complete feeding of the house in winter and in summer. Inverter system operates without any blames. The only one house where the light is always on in the window during shut off of electric power supply is the house of our client. Objects realized by GC «Terrikom»: electric power supply for mini-forge.